Does Trump go far enough to eliminate conflicts? President-elect Donald Trump, who raged against the elite as a candidate, is populating his administration with the ultra-rich. On Wednesday, he named billionaire Wilbur Ross, who has made a fortune cobbling together dying companies, as his commerce secretary, and Todd Ricketts, part of the billionaire family that owns the Chicago Cubs, as deputy commerce secretary. Another billionaire, Betsy DeVos, is his pick for education secretary. By comparison, the vast wealth of millionaires Steven Mnuchin, the ex-banker tapped for Treasury secretary, and Mitt Romney, whom Trump is considering for secretary of state, looks almost paltry. 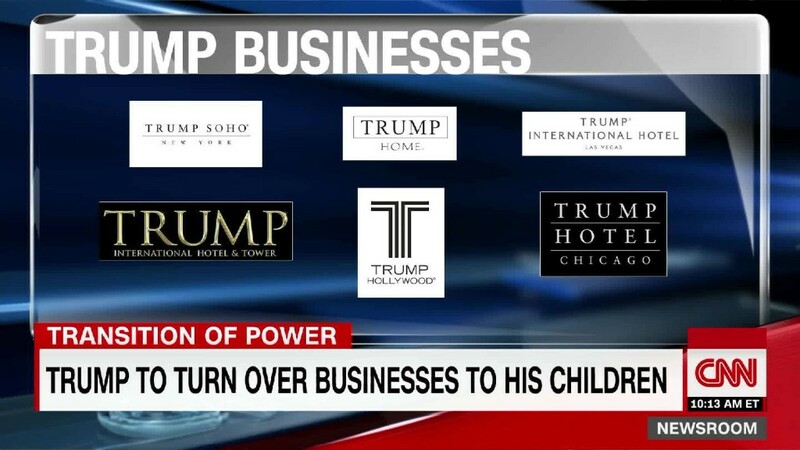 Unlike the boss, who as president will be exempt from most conflict of interest laws, these top administration figures will need to reckon with their financial entanglements before taking office. Federal law requires them to dump problematic assets or recuse themselves from certain matters. Ross told CNNMoney in a phone interview Wednesday that he will take whatever steps are required. "Anything the White House counsel thinks I should divest of, I will divest," he said. "Everything else will go into a blind trust." Ross, designated for commerce secretary, is the chairman of the private equity firm WL Ross & Co. He is vice chair of the Bank of Cyprus and sits on the boards of a steel company, a bank holding company, and a natural gas and oil drilling company, according to regulatory filings. Ross said he would resign from all boards to avoid conflict. Asked how any holdings he retains would be invested, he said, "that will be up to the blind trust." How others will resolve their conflicts -- and in some cases what financial ties they have -- is not yet clear. The Trump transition team did not immediately respond to a request for comment. The Office of Government Ethics, which works with candidates through the nomination process, is expected to review their financial holdings. The guiding principle: High-level government employees must act on behalf of the people, not themselves. "Anything -- any investments you have, or holdings you have that may conflict with that -- cause a serious problem," said Larry Noble, general counsel of the Campaign Legal Center, a nonpartisan, nonprofit government watchdog group. Steven Mnuchin, President-elect Donald Trump's selection for Treasury secretary. Mnuchin, for example, is a former partner at Goldman Sachs turned Hollywood producer who still has deep ties to Wall Street. 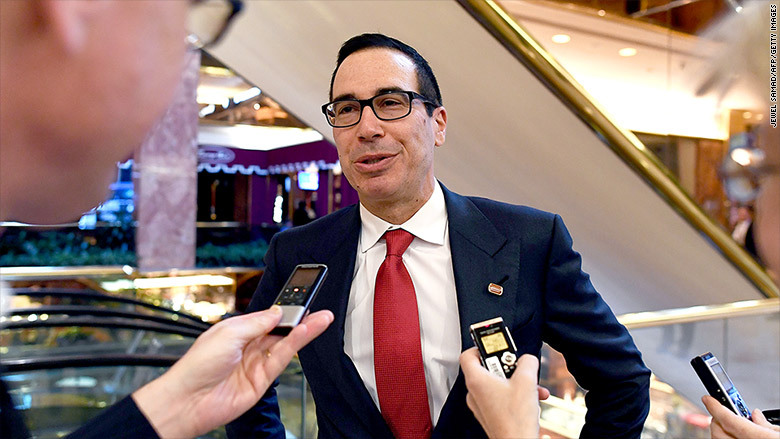 While the full extent of his financial holdings isn't yet known, Mnuchin would likely need to at least resign his seat on the board of CIT Group, a multibillion-dollar financial holding company. Both Mnuchin and Ross have ties to the industries they will be working closely with or regulating in their new roles. It's not unusual for administration jobs to go to people with such intimate connections, said Kenneth Gross, a partner at the law firm Skadden, Arps, Slate, Meagher & Flom who has provided legal assistance to several presidential campaigns. "There's none better than those who have been there," Gross said. "If you bring in someone who has no experience in how the regulated community operates -- whether it's energy, whether it's financial services, or any of the various departments within government -- there's a good chance that that person will not be as effective in their position." The Trump transition team has outlined some of its own rules for its new employees: Anyone being vetted for a high post must prove that they have stopped working as a lobbyist, and accept a five-year ban from lobbying after leaving the Trump administration. They must also agree never to represent a foreign government, Trump communications director Jason Miller told CNN earlier this month. DeVos is married to an heir to the Amway fortune, but little is publicly known about her holdings, and she did not respond Wednesday to a request for information about them. She would need to give up anything that could present a conflict for her duties as education secretary -- for example, a stake in a company that runs charter schools or provides cafeteria services, said Norman Eisen, a visiting fellow at the Brookings Institution who led ethics initiatives in President Obama's first term. Divesting to avoid conflicts can be a massive undertaking. In 2006, Goldman Sachs CEO Henry Paulson was forced to unload about $500 million worth of Goldman stock when he was nominated by President George W. Bush for Treasury secretary. Federal tax law does provide some incentives. Paulson was allowed to defer paying the capital gains tax he owed on the sale as long as he put the money in a diversified investment fund approved by the government. If the nominee doesn't want to divest, there is another choice: Cabinet picks can recuse themselves from some decisions that raise ethical questions. Carla Hills, who served as U.S. trade representative under President George H.W. Bush, pledged to step away from some cases handled by her department because of ties to her old law firm. And Penny Pritzker, a billionaire heir to the Hyatt Hotels fortune who now serves as Obama's commerce secretary, promised to resign from the company and stay away from any matters that could conflict with her government job -- though she kept her Hyatt stock. "The agency has determined that it is not necessary at this time for me to divest my interests in these entities because my recusal from particular matters in which these interests pose a conflict of interest will not substantially limit by ability to perform the essential duties of the position of secretary," she wrote in an 18-page letter to an attorney at the Commerce Department. Recusal isn't always a practical choice. "It's harder for a secretary of state to say, 'I'm not going to deal with any issues involving the Middle East, because I have an investment in a company that's doing security in the Middle East,'" Noble said. Foreign business ties could make things complicated for a nominee like Rudy Giuliani, the former New York mayor and a top Trump adviser, who was listed by the transition team Tuesday as one of four finalists for secretary of state. Giuliani has done consulting work for foreign governments, including Qatar and Serbia. He has defended that work, telling CNN it was "perfectly legal." Not everyone in contention for a top spot in government sticks through the process. Eric Schmidt, the chairman of Google's parent company, Alphabet, was once said to have been under consideration for commerce secretary under President Obama. But taking the job probably would have forced Schmidt to sell billions of dollars' worth of Google stock he owned at the time. He ultimately declined the job, telling reporters he had no interest in working for the federal government. "There is a sacrifice of working for the government, especially in a high-level position," Noble said. "And you have to decide whether you want to make that sacrifice."